Joining Team Kowalskiy this time 'round is Edinburgh trio Toy Machene. 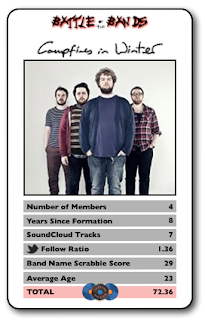 They're no strangers to the blog, and with their strong SoundCloud presence (including their entire debut album) and dare-I-say advancing years (as someone who's only 2 years off it, 30 is the new 20 though! ), I was confident we'd have a fighting chance against whoever Neil had picked. Little did I know he'd picked the crème de la Croy, Campfires In Winter. Here's a quick recap of the rules for those who don't have a clue what's going on. You can read them in full over here. This round, it was Neil's turn to choose which of the three attributes we'd be dueling with. For each of the three, the person with the highest value gets one point, with both getting a half-point in the event of a draw. Losers... get a big, fat ZERO! In the end, Neil went for Years Since Formation, Twitter Follow Ratio and Band Name Scrabble Score. As ever, all stats were correct at the time of battle, and were totted up before a last minute Twitter clean-up from those dedicated Toy Machene chaps. And the winner of Round 7, and fair play to them, is... Team Scottish Fiction. It got off to a honking start for me given Toy Machene's new-kids-on-the-block status compared with Campfires In Winter's impressive 8 active years. And to be honest, it just got worse from then on. 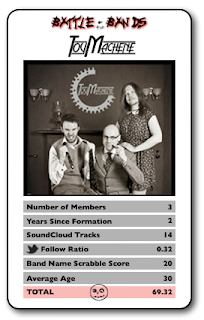 We were pipped on the Twitter Follow Ratio and Band Name Scrabble Score by pretty slim, but decisive all-the-same, margins. 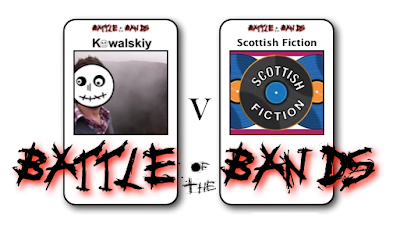 So, by 3 points to 0, Team Kowalskiy go home with their tails between their legs, and Scottish Fiction have drawn the series yet again at 3 wins apiece... and one draw. As is always the case, even more-so when I get beat, this isn't about me or Neil... it's all about the bands! So I'll start off with my boys. Like I said above, their debut album Welcome To Toyland is up on SoundCloud for your listening pleasure... and it is an absolute pleasure. In fact, I challenge you to name a funner, or more fun, album released this year. Their ode to Mr. Cruise in particular is top-notch! And now, onto the victors. To think Campfires In Winter were firm favourites of mine... well, they still are actually. Earlier this year they let slip a trio of demos from their long-awaited debut album. It's only been 8 years in the making!